I'm looking for some opinions about mutes. 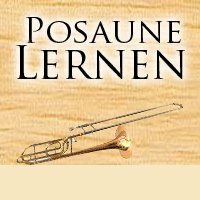 I just purchased my first bass trombone and am now in the process of buying mutes for it. For tenor I use the Denis Wick cup/straight convertible mute, which is incredibly convenient, and also a great deal (two mutes in one). I like the sound of the cup mute, but I'm not sure about the quality of the straight mute. I haven't played on enough other straight mutes to really compare. What do you guys think about the sound of the straight mute part of the Denis Wick convertible mute? I'm thinking about buying the same convertible mute for my bass, but I'm also wondering if I should try buying a separate straight mute to get a better sound. In your opinion, what is the best straight mute out there (for tenor and/or bass)? If it's the one I'm thinking of, I think of it more as an adjustable cup than a straight; its way to inconvenient to change between cup and straight, and the DW straight is much better. I much prefer dedicated mutes. I find I use a straight mite the most but cup and plunger show up every once in a while. If your playing in a group you may want to see what the preference is to achieve a unified sound. Practice putting them I'm and taking them out too, you don't want to add the sound of your mute or slide bouncing on the floor. Having a stand mounted set of mute holders makes life easier too. I have Wick straight/cup mute for my bass trombone and like it a lot. As a cup mute, it's great. As a straight mute ... well ... I think it's okay as a sort of emergency straight mute or if I have to play maybe 3 not very critical notes with it, etc. I also have a Wick straight mute that I like a lot. But in general, what's always in my bag is my straight H&B "stone-lined" straight mute. Why? It's not expensive (depends a bit on where you get it). Everyone else in the section uses one (at least for most rehearsals). It's pretty light. And finally, it's almost impossible to destroy -- unless you, like, drop an anvil on it maybe. And it bounces very well (even off a stone floor -- about 3 inches) without significant damage. Oh yeah, and it sounds pretty good. But in general, what's always in my bag is my straight H&B "stone-lined" straight mute. I have to agree with Gary on all points. My Wick combo bass trombone mute is just not a great straight mute. 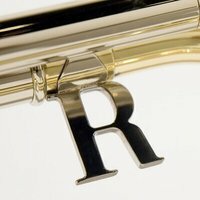 I did recently purchase a Wick "50th anniversary" (gold) aluminum straight mute for my tenor trombone. It's very fine! I love my Job Ral copper bottom straight mute. By far and away the best mute I've ever used. My cup is the wick you currently use. I'd love to try a few different options on this front, but it's way down my list of priorities at this point in time and the wick is more than adequate for my needs. My favourite cup mute is the Humes & Berg 199 Stonelined - I can get a wonderfully soft tone from it or make it zing, but often I end up using a Wick combo mute to more easily match the rest of the section. I have a stone-lined cup mute for the bass, but it's just too heavy for me. But I think I got the larger (199) model rather than the smaller (171). So you need to take care with that selection. I have the Wick adjustable cup for my bass. I have a King 7B and the H&B 199 fits funny -- makes it stuffy while the 171 doesn't fit at all (it really fits my symphonic tenor). I use the straight part as a straight mute in a pinch, but I also own some straights for it. I have the H&B fiber straight (use for Big Band) and a symphonic mute. Symphonic mutes tend to be a little odd for Big Band, especially if everybody else is using a simple conical shape. On the other hand, the symphonic mute is what classical composers were expecting. both bass mutes is what you need. Both play really well. H&B fiber cup mutes need often to have adjusted the corks to the correct level. In case you get some rolling tones in the double valve register, it's pretty easy to remove them by drilling 2 or 3 (at most) 4mm holes along the bottom (where the red and white meets). This is the classical big band sound. In Brass bands, people often use DW aluminium cup mutes, but honestly, the H&B fiber has a nicer sound. The tom crown does work really fine intonation wise, if you adjust the corks correctly. I've had to put some holes in most of my mutes to get them to sound right and let certain notes speak. It's feather light and I really like the response and sound. But I confess I don't use it much because most of the stuff our band plays doesn't require a mute, and when it does I use the H&B straight one because I don't want to risk denting the Wick. However, if I have a distinctive part I'll use it. By the way, I made a couple of mute stands out of 3" PVC and flanges, painted flat black, that are just the right height and sit on the floor beside me when I do need these mutes. Just more stuff to carry. My favorites cups are Jo-Ral for large/medium bore, H&B for small bore and Wallace for bass. I have a King 7B and the H&B 199 fits funny -- makes it stuffy while the 171 doesn't fit at all (it really fits my symphonic tenor). You have to build up the corks on the 171, then it will play really nice with a smaller bass like the King 7B. The 199 is a funny beast, I think the straight part is too big in diameter for most basses. Regarding the H&B 198 and 199, I feel they are best suited for large throat, 10" bell basses like my own instrument or Holton 181s and such. I don't think they'd fit right in most others without some adjusting of the corks, including the Bach 50. Try before buying if you decide to go this route, if you can. 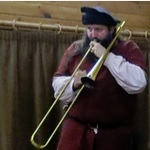 I myself am wanting to try some other mutes in my Besson 943GS though. Just need to make the drive down to Tacoma to do so. The Denis Wick convertible is crap in my opinion and to my ears! There a too many occasions, when you need straight and cup, and to rebuild the Wick takes too much time. And it sounds neither good as a straight nor as a cup.